“If they don’t love, support and appreciate you, they don’t deserve you. I’ve gotten so many great responses to my inquiry on how to heal from an abusive or toxic relationship. Thank you so much for all of you who responded! If you have not yet, I’d love to hear from you. Hit reply (or send me an email to olga@mastertheartofchange.com) and let me know what would you like to learn/understand when it comes to healing your past from traumatic relationships with your ex (or maybe you are in one right now). How do we recognize that the relationship has become poisonous vs us taking the blame and second guessing ourselves. So, today I’ll walk you through 10 traits of poisonous people and a video on how to deal with people like this in your life. 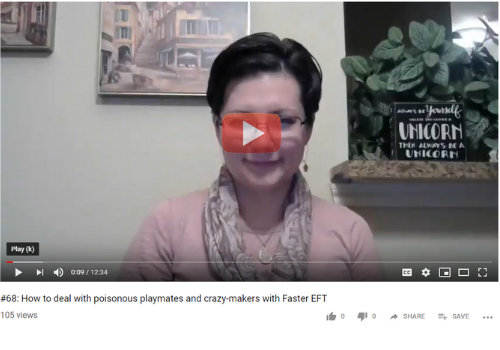 Those of you who went through “The Artist’s Way” – an amazing book by Julia Cameron on creative recovery and discovery, know that she refers to such people as Poisonous Playmates. The precision with which Julia describes my ex husband is ASTONISHING. Now, he is a good guy (on a deeper level), he really is, but my oh my, does he fit the prototype well. We all go through an emotional healing journey at our own pace. Do not expect your blocked friends to applaud your recovery. It’s like expecting your best friends from the bar to celebrate your sobriety. Be particularly alert to any suggestions that you’ve become selfish or different. (These are real red-alert words for us. They are attempts to leverage us back into our old ways for the sake of someone else’s comfort, not our own). So how to do you know that the person you are with is the emotionally abusive one (for sure I will use Julia’s term and call them ‘crazymakers’)? Crazymakers are the type of people who LOVE to create drama. Everyone around them acts like a supporting cast. Remember, we are always either creating or creatively sabotaging ourselves. They get really fancy. You know that type: charismatic, but out of control, long on problems, but short on solutions, the kind that blame you artfully, and nothing’s EVER their fault. Can you recognize this in anyone around you? By now you are probably wondering if they are that CRAZY what are we doing being involved with them? The answer is simple: for us, as blocked creatives, it’s easier to get lost in the drama, than look within. If you are involved with a poisonous playmate, it is very important. Admit it. Tap on it. There are 7 billion people on this planet. You deserve to be surrounded by the ones who align with and support you on a deep level. The bottom line, next time you catch yourself saying “He/she is driving me crazy!” Ask yourself how are you protecting yourself by keeping this relationship in your life. If you are still in that dynamic, chances are you are still aligned with this energy on some level. Remember, as you change within, your relationships transform. Now, hit reply and let me know some of the most common qualities YOU are bumping into when dealing with toxic people. Tap, breathe, be kind to yourself. Remember, you are loved. P.S. Need help decluttering crazymakers from you life? I’d love to help! Whether you are single, dating, or have a partner, I offer a free 20 min consultation (scroll to the bottom of the “Tap into LOVE” page to apply here). In this consultation, I will address any questions you have about how I work with people 1-1 as well as offer insights on any relationship struggles you are currently going through.